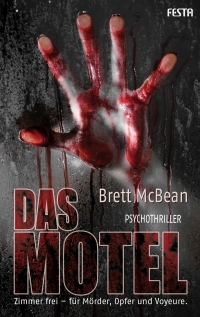 Das Motel is the German edition of my first novel, The Last Motel. Available now from Festa Verlag. Will there be an English version of this and will it be available in the USA? I hope so. I’m dying to read it. I love the cover with the bloody hand! ok I missed that it was the German edition of the last motel. That’s good, I can get that in the US on Amazon.com. I would like the German edition as well because of the cover. If you do pick up THE LAST MOTEL, I hope you enjoy it. Thanks for coming ’round my corner of the net. At first : I´m sorry for my english, but i must write here something…. Our German McBean-Editions from Festa are really great, i love these Covers. I´m from Bavaria / Germany and since i read my first McBean, Die Mutter (The Mother) , i´m a big Fan. In a few Days i will get into the Motel, Yeah !!! Die Sünder: Tales of Sin and Madness is coming in August (in German) – that will be a great Summer, Hell Yeah !! Mister McBean please write faster, we need more of this Stuff !!!! Very kind of you to write. I’m glad you enjoyed Die Mutter, and I hope you will also like Das Motel. I also love the Festa covers, and am thrilled to be working with them to bring the good folk of Germany my books.